The Kamchatka Peninsula is an extraordinary place, with virtually no flat areas. The peninsular is cut lengthwise and crosswise by massive mountain ranges—the Sredinny (“central”) and Vostochny (“eastern”)—and dotted with 300 volcanoes, of which 30 are active. Visitors can descend them, too, on skis and snowboards. Last winter on Kamchatka turned out to be exceptionally snowy. Of course, there is always plenty of snow here, but this year there was more than usual—so much that in some areas the roads did not melt until August, and some even needed to be plowed with tractors. And this was in the height of summer! Consequently, ski enthusiasts on Kamchatka were skiing in its mountains long after lifts at the ski resorts elsewhere had closed. Kamchatka is all about heli-skiing. Traveling by helicopter is the only way to reach corners that are hidden from view by the chains of the mountain ranges. With its blades slapping, the helicopter lands on the top of a mountain. The door opens, and one by one the snowboarders jump out into deep snow. Unfortunately, heli-skiing is a rather costly pleasure. Helicopters cost around 160,000 rubles for one hour, and in order to bask in the full marvel of skiing on Kamchatka, most skiers would agree you need at least two hours. However, this depends largely on the group’s abilities. For advanced skiers, it is possible to cover 10,000 vertical meters in a day. Another important rule for heli-skiing on Kamchatka is to use the services of experienced guides with an intimate knowledge of the particularities of the terrain, weather, snow conditions and other factors that are vital when skiing in the mountains. Only they can point out the correct path so that a skier, even a skilled one, does not fall victim to an avalanche. Some people think that only backcountry skiing allows travelers to see the mountains’ true beauty and to experience each meter of the subsequent descent. Only the first few dozen steps of the ascent are difficult. After that, it is as though you are playing a game: climb higher and see more. 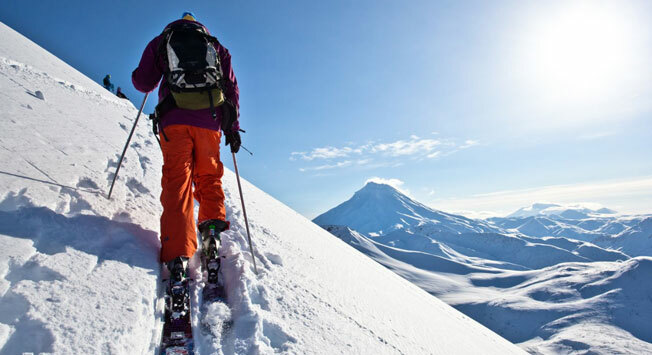 Kamchatka is an ideal option for people who like to travel in the backcountry style. Moreover, it is possible to reach a mountain in a variety of ways. For example, one can go on foot from the nearest road, by snowmobile, by sailing yacht or by cutter. While the first options are more or less understood, the last ones came to Kamchatka only a few years ago. However, one can now say that Kamchatka is the pioneer of this mode—backcountry sailing—in Russia. A map of the peninsula shows that its eastern bank is spotted with many bays, into which the mountains drop. For example, Russian Bay was formerly filled up with freshwater. Thanks to the water’s unique content, it does not spoil for a long time. Now, in Russian Bay, whose basin is 8 kilometers long, it is more common to find freeriding and backcountry skiing enthusiasts. They come here on sailboats or cutters. The trip from the port is around six hours, depending on the boat’s power. Such landscapes cannot be found anywhere: steep cliffs that protrude, like fingers, from the water; thousands of birds that build their nests right on the precipices; waterfalls that with a roar send millions of cubic meters of water into the ocean; sea lion rookeries. And all around are mountains, volcanoes and untouched slopes. Kamchatka has several ski resorts. The most interesting in terms of terrain and variety are Krasnaya Sopka and Edelweiss, which are in Petropavlovsk-Kamchatsky, and Moroznaya in Elizovo. One run costs 50 rubles. The resorts are open from 9 a.m. to 6 p.m. They are fully outfitted with lifts, cafés, rental equipment and the services of instructors. Several local agencies offer heli-skiing and backcountry tours for the more adventurous.